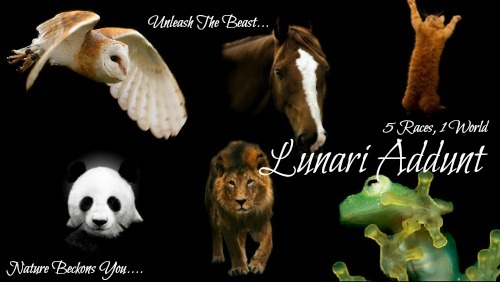 Greetings friends and welcome to Lunari Addunt! Wishing to join our wonderful world? Here are some helpful links to get you started today! For questions, comments, or concerns, feel free to message any of our amazing staff! We hope to see you soon! With the colors of fall upon the ground, brings a lively a bundance of prey before the harsher times hit. Weather can be considered decent to some, though the nights are icy. Please come join us there! Welcome to Lunari Addunt. Here you will find: Species, Rules, Information, Present Yourself, and Ranks. Accepted members of the Human Race are found here. Here is where all the Humans live and the land they own. Humans will come here to join the group of Humans Against The Different. Although you can find humans without the land, come to the General's Office to join the brigade. Accepted members of the Vampire Race are found here. Here is where all the Vampires live and the land they own. Vampires will come here to join the clan. In the day, Central Park does not show any signs of danger, but at night it is completely transformed. Beware, travel in pairs, and stay alert. Accepted members of the Werewolf Race are found here. Here is where the Werewolves live and land they own. Werewolves come here to join the pack. Accepted members of the Shifter Race are found here. Here is where all the Shifters live and the region they own. Shifters come here to join the Shifter group. Accepted members of the Mora Race are found here. Here is where the Mora live and land they own. Mora come here to join the Mutts. NO ADVERTISING. OOC only, No IC.